BATIK is one of the oldest art forms - samples have been found in Egyptian mural paintings from at least 2500 B.C. Cotton material is used as canvas on which the pencil drawing is done. Alternating layers of wax and dye are added to completion. The wax is painted on with fine brushes and the fabric is submerged in dye. The wax is removed by ironing between paper. The batik paintings by Ms. Mills are created with this exacting process. The knowledge of what to expect, as a result of many years of combining various dyes, provides for harmonious compositions in the batiks. Ms. Mills' early batik consisted of simple designs. As a result of many years of intense persistence of mastering the art, her style has emerged into a more intricate one. 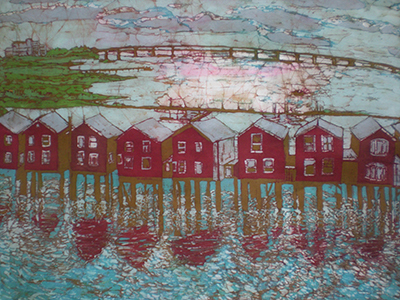 Landscapes are prominent in her batiks, sometimes including people and events that she has personally experienced. Colors are limited in the batik process and emerge through the representation of trees, mountains, rivers, and buildings as far as the monochromatic nature of the batik medium allows. Ms. Mills is recipient of many awards for her batiks. First Place - Fine Arts Fiesta, Wilkes-Barre, Pa.
MacDonald Gallery, College Misericordia, Dallas, Pa.